- High display quality for VGA, SVGA, XGA and SXGA resolution. 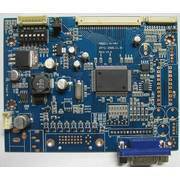 - Support LVDS and TMDS interface to adapt various type of LCD panel. - Low cost, Reliable H/W & S/W design.